The question was raised during an earnings call. We're still calculating the chances of Red Dead 2 coming to PC, and right now Take-Two is just as hesitant to talk about Red Dead Redemption 2 on PC as Rockstar. Yesterday, the publisher hosted an earnings conference call and the subject was raised again. The hour long call—trust me, it felt longer than an hour—was a jargon-filled discussion of everything from marketing to revenue streams, but right at the end, an investor piped up with a question many of us have been wondering. A long pause followed, with Zelnick eventually asking the investor to repeat the question. Then he dodged and weaved. It is, of course, not surprising that Take-Two wouldn’t want to spill the beans on something as anticipated as a PC release for Red Dead 2 in an earnings call, but you never know. 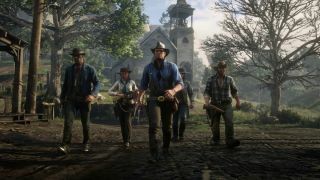 A few commands in the Red Dead Redemption 2 companion app hinted at a PC version. We live in hope, because it's somehow harder to wait for console ports in 2018 than it once was.